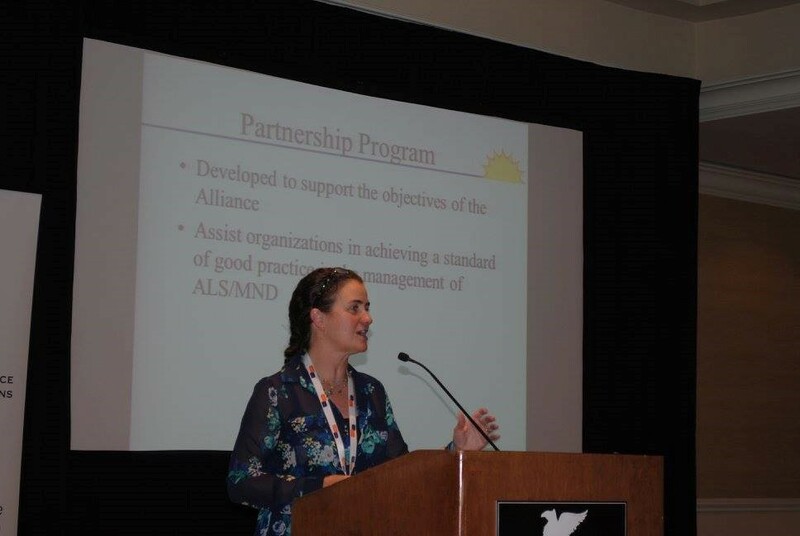 The 26th International Symposium on ALS/MND was held in Orlando, Florida this December and it was a week filled with the sharing and exchanging of experience and information. The Motor Neuron Disease Association in cooperation with the International Alliance of ALS/MND Associations holds these meetings annually and the ALS Association was the host of this year’s event. The ALS Hope Foundation was privileged to have representatives at each of the meetings throughout the week. The International Alliance of ALS/MND Association meeting is the first of the week and brings together associations from around the world. Twenty-three different countries were represented at this year’s meeting, with six organizations from the United States in attendance. Dr. Sara Feldman is a member of the Board of Directors and is on the Program Committee for the meeting. Dr. Terry Heiman-Patterson and Jackie Nicodemo also represented the ALS Hope Foundation during the two-day long meeting. The presentation themes this year included Fundraising and Strategies; Allocation of Resources; Challenges to Providing Services; Services, Programs and New Ideas to Support PALS; and Partnership, Mentorship and Collaboration. Following the opening remarks and General Meeting lead by the Chairwoman, Carol Birks, MND Australia, there was an introduction of new members, which included China, Columbia, Cuba, India, and Russia. There are now over 30 countries with member organizations in the Alliance. The Ask the Experts follows the Alliance meeting, and this year it was led by Dr. Lucie Bruijn, the ALS Association’s Chief Scientist, and the panel included Dr. Rick Bedlack from Duke University and ALS Untangled, Dr. Michael Benatar from the University of Miami, and Dr. Ammar Al-Chalabi from King’s College in London. Watch a video of the Ask the Experts session here. The Allied Professionals Forum is a day-long educational program and is held the day in between the Alliance meeting and the Symposium. The ALS Hope Foundation has supported the APF since 2003 and Sara Feldman was honored this year to take on the role of Co-chair after being on the Program Committee for several years. The program committee strives to create a program that is informational and relevant, and this year was another successful event. This day is an opportunity for Allied Health Professionals from around the world to share their experience and to network with other professionals from around the globe who are also trying to make a difference in the lives of people living with ALS and their families. Click here for an overview of the APF Presentations. Click here to view the APF presentations on YouTube. Day one of the Symposium began on Friday, December 11, 2015. The Symposium begins and ends with joint plenary sessions, then is divided into parallel tracks, one scientific and one clinical, for each session. Over 800 people, including neurologists, scientists, health professionals, association members, and PALS/CALS, attended the three day event and interacted in a dynamic way that seems unique to this meeting. Dr. Terry Heiman-Patterson attended the scientific presentations and Sara Feldman and Kelli Smith attended the clinical. To see an overview of the Scientific Meeting, here is Dr. Heiman-Patterson’s video from the ALSA/NEALS webinar.